Mirrors - From Classic To Contemporary! Mirrors are a great design tool that can be used to lighten a room, create an illusion of size and serve functionality or for getting ready for your day. Our collection of mirrors include simple designs as well as ornate pieces in a variety of shapes and sizes such as oval, square, and full-length mirrors. These can be used on the walls of any room to reflect its beauty or increase its brightness. Pacific Home Furniture’s beveled oval mirror framed with oyster shell will be a wonderful addi.. Round MirrorPacific Home Furniture’s Ania Mirror is perfect for any room.Width (i..
Beveled MirrorPacific Home Furniture’s Elegant Modern Mirror with curved beveled mirror ti..
Beautiful Mirror This beautiful Daria Mirror from Pacific Home Furniture will be a wond..
Walnut MirrorA wonderful French oval mirror in a walnut finish frame from Pacific Home Furniture.. Unique Metal Wall Mirror!This Mirror Is Surrounded By Metal Branches, Finished In An Autumn ..
Rectangular MirrorThis large rectangular mirror has a beautiful convex mirror frame. ..
Coastal Inspired MirrorThis beautiful rectangular mirror framed in abalone shell from Pacific Ho.. This Gold Finish Porthole Mirror 24" from Pacific Home Furniture adds sophistication, style, an.. This Navy Blue Finish Porthole Mirror 24" from Pacific Home Furniture adds sophistication, styl.. 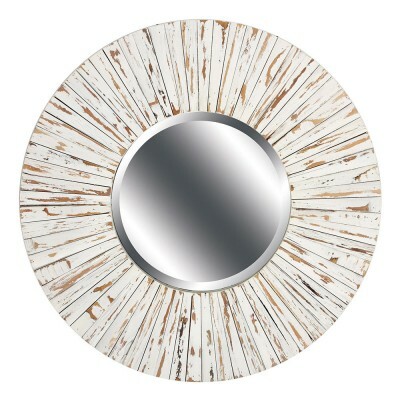 This Silver Finish Porthole Mirror 24" from Pacific Home Furniture adds sophistication, style, .. This White Finish Porthole Mirror 24" from Pacific Home Furniture adds sophistication, style, a..
Lace MirrorPacific Home Furniture’s panel mirror with an intricate silver leaf frame creat..
Rectangular MirrorPacific Home Furniture’s classic beveled rectangular mirror famed in a b.. Arched MirrorPacific Home Furniture’s unique arched beveled mirror framed in a washed wood..
Our white distressed round mirror functions as decorative wall art and a mirror. Whether your design..